Labour and the Conservatives are separately pondering that same question tonight - wondering whether their political rivals really are genuine about finding common cause. Guess what, just for a change, the leaderships of both of the main Westminster parties are dealing with boiling tensions on their front and back benches. And they both have reasons to tiptoe towards each other in these cross-party talks, but both sides too have reasons to tread carefully. In truth, both sides are serious that they could possibly get serious about a deal, but the obstacles are significant. The Tories have still not, and may never feel able to offer a clear promise of pursuing a customs union. 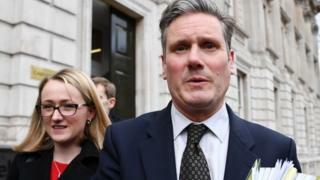 What sources familiar with the talks say the focus is right now, is trying to point out to Labour that the existing deal contains the possibility of shaping that kind of arrangement in the future. Irony upon irony, the backstop which the government has been protesting about for so long provides the ingredients for exactly that kind of relationship with the EU in the long term. That is precisely why Brexiteers hated it so much - because they feared (correctly perhaps) it might be used as the basis on which to build the kind of tight trading deal with the EU they seek to avoid. For the prime minister to overtly pursue such a deal is already provoking fury in parts of her party - although it's also striking now how frustrated some middle of the road Tory MPs are - fed up of what they see as both "extremes", hogging the oxygen and holding everything up. But unless and until Theresa May is ready to give a firmer commitment on customs, it is hard to see how Labour would be ready to sign on the dotted line. Although the two sides will meet again in the next 24 hours, Jeremy Corbyn again has expressed his view that the government hasn't shifted any of those red lines. And even if that were to happen, there are (at least!) two other big blocks to success. There is deep anxiety in the Labour Party about being able to trust anything that is agreed. The government's already promised that they could change the law to give guarantees in the Brexit implementation bill. But both sides admit privately even if they came up with some kind of "lock", it's just not feasible to rule out any future prime minister ever unpicking the deal. In a different era this might not be such a problem. But the prime minister has already said that she will quit, and quit once the deal is done. So of course, Labour MPs are very nervous about how the promises made in these talks could last. That's whether the next leader were to be Boris Johnson, Dominic Raab , Jeremy Hunt or frankly, the Queen of Sheba - it's about the permanence of any promise. And, as I understand it, the two groups, even with serious intention, have not as things stand been able to come up with a formula that guards against this. Second of all, officials and politicians in the discussions have talked about the possibility of another referendum on the EU - whether you call it a "confirmatory vote", a "ratificatory referendum", or a "people's vote" - another chance for all of us to have a say. This has not though yet been a big focus of the talks - it seems like an issue that has been danced around the edges. Here's the thing: a hefty chunk of the Labour Party is adamant that they will only back a deal if it comes with a promise of another referendum. And that opinion among Labour backbenchers has been hardening, not softening in recent weeks. So even if the talks can find away around the customs conundrum, and then find a "lock" to make Labour comfortable with any promises that are made, there is a third profound dilemma. Number 10 has always made it abundantly clear that the prime minister believes that's a nightmare not worth contemplating. The problem for these talks is that for a big chunk of the parliamentary Labour Party that's the dream they are pursuing. There are others who disagree, and disagree profoundly. But in terms of making this process work, the Labour Party's votes can't be delivered in one big chunk. With huge political imagination, invention, (whose mother after all they say is a necessity, and there's certainly a necessity right now), it is of course possible that this process could get there. In this long tangled process a lot of things that have seemed impossible can in the end come to pass. But just as both sides in these talks are serious, the problems are serious too.